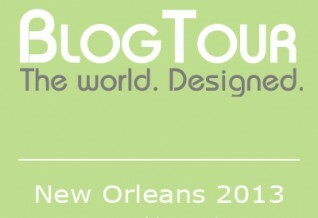 I am back after a formidable blogtourNOLA journey with the lovely Veronika Miller and an amazing group of designers/bloggers I had the pleasure of meeting. I debated on what to share with you in this 1st chapter of my New Orleans adventure. I decided to begin with setting the scene. And what comes to mind is BEAUTY. Beautiful architecture abounds in this gorgeous city. How can I even start to explain the beauty of New Orleans? There are no words, really. We begin on a warm, muggy day in April 2013. Destination: The Garden District. The Garden District was designated a national historical landmark in 1974. It is renowned for its beautiful 19th century mansions, some late Victorian homes and elaborate gardens. Greek revival, Spanish, French, British and Italian influences have come together to create an incredible architecture. It will give a sense of the laid back, green and lush vibe of this city. At this point, I imagine and hope your are rendered speechless. Good! This is truly a trip I recommend! Be sure to follow my blog posts on new Orleans over the next few weeks. A bientôt, les amis!